The day of the leafy greens! Well, the first of the year’s produce is coming in. 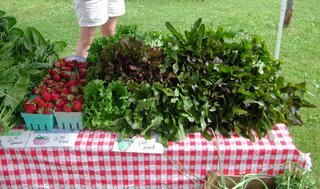 We went to the Lakes Area Farmers’ Market for the first time last saturday (6/24) and people were out in full force scouring DL for fresh produce. I think strawberries were the driving force. It’s all the talk about this time of year as people search high and wide for good berries. We sold a lot of berries, but the garlic scapes certainly got the most questions from people. FYI garlic scapes are the shoots a garlic plant produces in an attempt to reproduce. We actually set up on the “lakeside” of the market this year…we were there for a few market days last fall and we liked it, so we decided to return. I’m terribly proud of this red oakleaf lettuce. The only problem is that people aren’t familiar with it and would rather have the green leaf. Hey, come on, live a little. Red oakleaf tastes just as good as green leaf…I think it’s a bit “nuttier” in flavor and certainly prettier. Actually oakleaf and greenleaf make a good mix. Leave a comment The day of the leafy greens! Saturday: First market day of the year! Not a lot going on just yet…but it will grow. 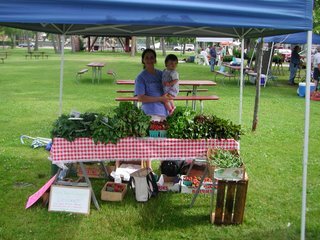 Again, we are at City Park in Detroit Lakes near the Pavilion (by the lake) from 10-2. Leave a comment Saturday: First market day of the year! Have you ever built a greenhouse? Greenhouses are great for growing produce. They protect the plants, decrease disease, and increase yields. Really no market gardener should be without one. Last year I built this mickey-mouse 10X10 greenhouse out of PVC pipe to start transplants. It swayed in the wind and basically collapsed by the end of the season–two nights last summer I was out with a roll of duct tape at 3 am just to hold it together. 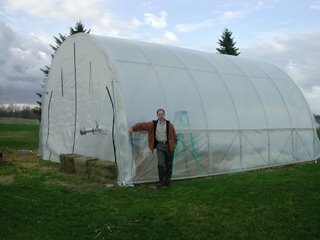 So, I sunk everything I earned last year at the market into a solid greenhouse…actually a “high tunnel” with a double layer of plastic for extra insulation. 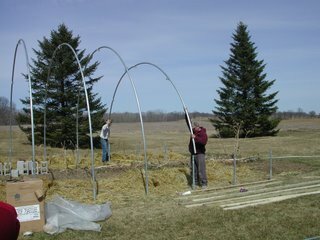 Most use high tunnels with a single layer and plant directly into the ground. I have a hybred of sorts, first starting my transplants on tables and planting directly into the ground when I’ve finally moved them into the field. Have you ever built a greenhouse? It’s a nightmare. I had helped put plastic on other greenhouses in my apprentice days, so I was estimating a good afternoon to do the job, maybe 4-5 hours. Problem is, putting the plastic on is the easiest part of greenhouse construction…we were in for the duration. 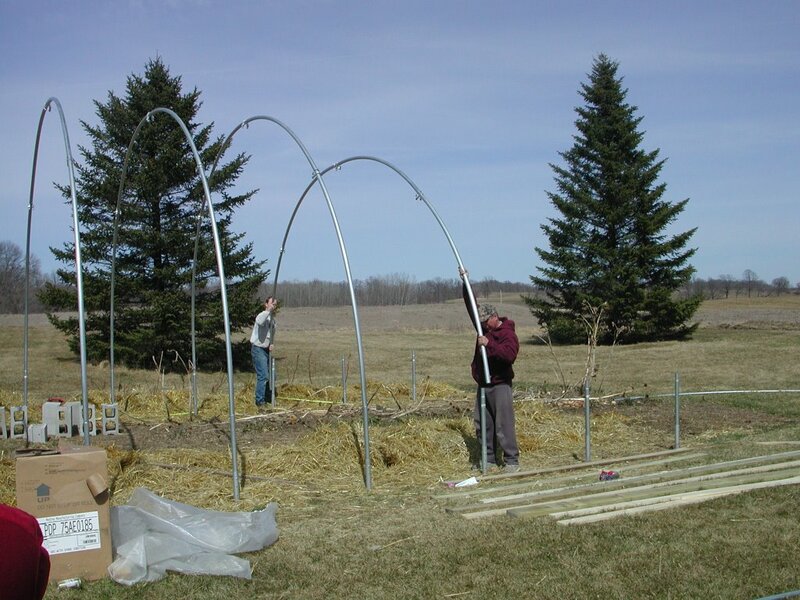 My big learning about building greenhouses… it’s all in the framing! Building requires many holes and screws, which takes a lot of time. It also takes a lot of balance when you are atop a ladder which is in a trailer in a 20 mile-an-hour wind! All told, my 4-5 hour project took 18-20 hours and that’s with the help of parents who invested their whole weekend. Who could ask for better parents? 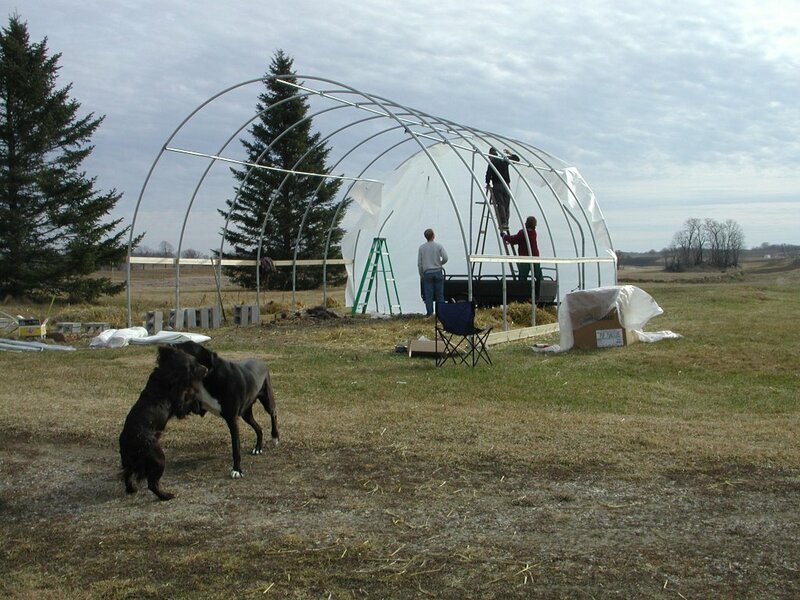 We’ve certainly had our stops and starts getting the greenhouse working for the season–it was filled with propane one day when high winds made the sidewalls flap so much that the propane line was pulled out…I’m glad I don’t smoke. Now that it’s done, it’s not going anywhere in my lifetime. It’s currently filled with Gourmet (orange) and Labrador (yellow) peppers, eggplant, basil, and a couple rows of cherry tomatoes. Leave a comment Have you ever built a greenhouse?